“The kitchen just needs too much work.” – Words you don’t want to hear from potential buyers of your home. We all know that the kitchen is a HUGE selling point for home real estate. Especially in this economy, it is important to make sure yours looks as hassle-free as you can afford to make it. If you’re trying to sell your home, take a look at your kitchen and be honest…would you want to buy it? If it needs some work, here are some inexpensive ways to give your kitchen a fresh new look before putting your home on the market. Put on a new face. Reface your cabinets. What you’re going for is the appearance of new cabinets. Often, this look can be achieved with new cabinet doors, or even just a fresh sand and paint job. Just be sure to remove your cabinet hardware so as not to get paint on them. Get a new “handle” on things. You’d be surprised how big of a difference new hardware can make on the look of your newly painted cabinets. Overall, the cost of some beautiful hardware is a small price to pay to sell your home; and you don’t have to spend an arm and a leg as there are plenty of affordable, yet striking options. Floor the competition. Yep, you guessed it…If your floor isn’t cutting it, it needs to go. There are plenty of reasonably priced options that will change the overall appearance of your kitchen. If your budget allows, it may be worth it to install some ceramic tile, as it is often a kitchen favorite, but if you can’t afford it, look into laminate, vinyl, linoleum, cork, or even stained concrete as some options. 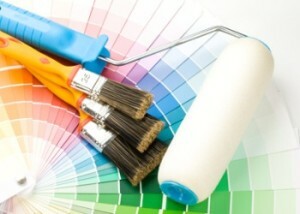 Make sure you choose a color or style that works with the rest of your home and gives a fresh look to your kitchen. Light up your life. If your lighting fixtures are old, or just plain ugly, you know what you need to do. And if there isn’t enough lighting in your kitchen, that’s something you should fix as well. From track lighting to under-cabinet fixtures, there are many ways to shed a little light in the kitchen. Paint the town red. Well…maybe you’d better stick with neutral…and it would be less expensive to paint your kitchen instead of the whole town (that would require a lot of paint). A new coat of paint can sometimes make ALL the difference. Your kitchen will look a lot cleaner with a fresh neutral coat. Just be careful not to drip on countertops, cabinets, floors or appliances. Its time for an upgrade. If your money allows, upgrade your appliances, as they are also a huge selling point. If you can’t afford to upgrade everything, at least make sure the appliances match each other. Don’t forget to count(er) your blessings. Buyers love a beautiful and functional countertop. Granite, quartz, and Corian are extremely popular and widely accepted. But if you’re not able to afford those options,laminate is now available in so many colors and styles – and there is definitely one that will give your kitchen that “brand new” feel. Take a look at your current kitchen, and figure out which areas are holding it back. If you can’t decide, call in friends, family or an expert to answer the tough questions – then get to work on your new buyer-friendly home.